Back in 1998, the federal government asked the Texas A&M Transportation Institute to find a way of moving freight without trucks on highways. Eighteen years later, the researchers debuted their prototype on Friday. BRYAN — Back in 1998, the federal government asked the Texas A&M Transportation Institute to find a way of moving freight that didn't use trucks on highways. Eighteen years later, the researchers debuted the first Freight Shuttle System prototype on Friday. What they came up with is a system of automated, electric-powered transporters that carry trailers and containers on elevated highways, keeping air cleaner and roads safer by taking 18-wheelers off of highways. The idea was debuted by Gov. Greg Abbott and officials from the university and Freight Shuttle International, a private corporation that is financing the project. FSI was founded in 2005 and partnered with the institute to patent features of the freight shuttle system and raise private capital to build prototypes. The corporation and Texas A&M University now hold 17 related patents. "Economic development and freight transportation go hand-in-hand," said Stephen Roop, founder of FSI and senior research scientist at TTI. Designers envision using the transporters to move freight over short distances or as far as 500 miles. Up to 70,000 pounds of freight can be moved at 60 miles per hour using one-third of the energy that heavy-duty diesel trucks consume, they said. Roger Guenther, executive director of the Port of Houston Authority announced at the event that the port is already exploring using the technology, building a five-mile system linking Barbours Cut and Bayport. It might be extended to 20 miles in the future. FSI is raising capital and plans to develop the systems without taxpayer money, Roop said, by licensing the technology to customers so they can build and own the systems. Developers are eyeing the Texas-Mexico border for potential sites, and FSI is already in contact with Mexican states including Juarez, Chihuahua and Monterrey, Nuevo Leon. "We did a cost analysis in El Paso-Juarez for a 12-mile system and the cost that we discovered through traditional construction methods was between $12 and $13 million per mile," Roop said. "That's $150 million for physical infrastructure, not counting electrification, property for terminal locations and buildout of those terminals." Aside from environmental benefits, Roop said the system could reduce potential for truck-related highway crashes and help offset an expected shortage of freight drivers in the next decade. It will also improve reliability because it can operate 24/7 without any limitations. "Sitting in traffic for a trucker is losing money," Roop said. "It's a very economical system with low energy consumption." Abbott, who helped unveil the freight shuttle, said that with the expansion of the Panama Canal, ports in Texas will face even stiffer demands to move freight more swiftly. 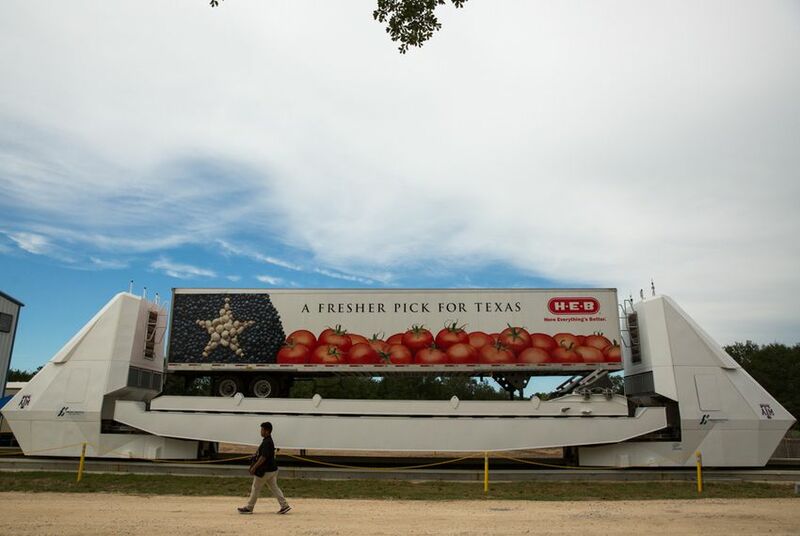 "For more than a decade, Texas has been the number one exporting state in America, and freight movement is vitally important in our state's economy," Abbott said. "FSS can bring millions of dollars into Texas economy and open the door to millions of dollars of private investments. More than just a tool for expediting freight from ports, it’s a vision for ways in which we can relieve congestion across the entire state." Texas officials restricted high-speed rail development after rejecting a private firm’s plans to build a bullet train between Houston and Dallas. State lawmakers asked Attorney General Ken Paxton to weigh in on who should handle vehicle registration renewals amid turf battle between the Department of Motor Vehicles and some Texas counties. Disclosure: Texas A&M has been a financial supporter of The Texas Tribune. A complete list of Tribune donors and sponsors can be viewed here.